A call to Axel Douque at Ocean Independence brings confirmation of a substantial €750,000 price reduction on the 26.36m motor yacht Cohete by an owner who doesn't have time to use her. Cohete was built in 1965 by what was then called the Leopoldo Rodriquez yard in Italy for the offshore racing legend Vincenzo Ballestrieri. Designed by Renato 'Sonny' Levi and RINA classed, she sleeps nine guests in five cabins and cruises at 14 knots powered by twin 1035hp MAN engines. 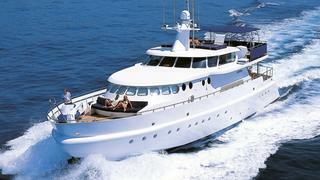 This superyacht was rebuilt and refitted in 2005. Cohete is now asking €1.75 million.